There’s a lot of hype at the moment as the legislative calendar gets into full swing in the Senate. 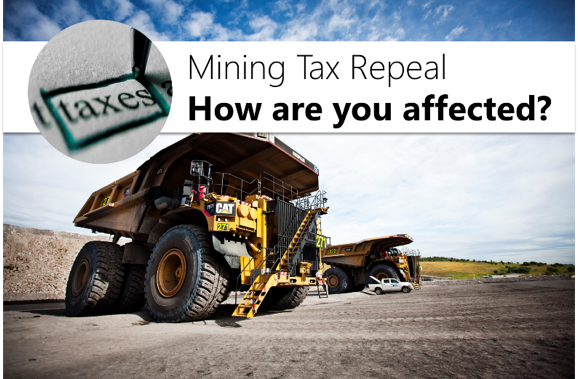 Recently the government successfully repealed the Mining Tax, which has come with a series of concessions. So what does that mean for you? Without the politics and media beat-up we want to get to the bottom line and let you know how this will affect you. The Mining Tax is officially titled the ‘Minerals Resource Rent Tax’ and was passed into law by the previous government in 2012. This Bill was largely controversial due to the Australian economy’s heavy dependency on the mining sector. To repeal the tax however, the Government have had to make some compromises. First of all, don’t take all the hype at face value. An individual’s superannuation is NOT being frozen. All that is being frozen is the percentage which employers must pay into employee’s superannuation, which is being held at 9.5% until 2021. Several changes to the superannuation guarantee schedule have been proposed in the past. 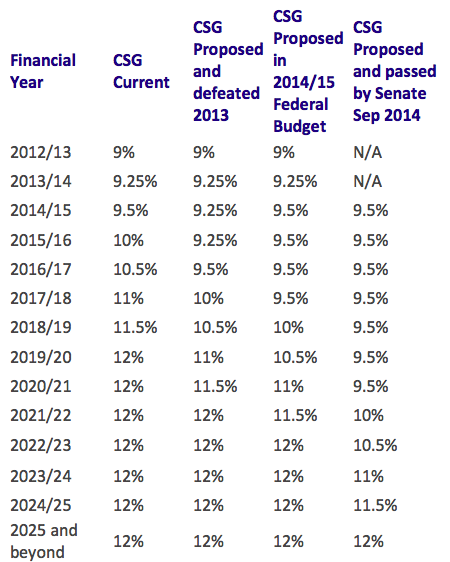 Below is a table outlining approved, proposed and denied schedules *CSG = Compulsory Superannuation Guarantee. These changes have turned the clock back on small business asset depreciation claims. From 2012 small business entities (SBEs) could deduct assets costing less than $6,500. As of 1 January 2014 this amount has been reduced to $1,000 for an immediate deduction. Assets costing more than $1,000 will need to be allocated to the SBE’s general pool and depreciated at 15% in the first year, and 30% in the years to come. 1 January 2014. SBEs that have purchased vehicles up until 31 December 2013 are eligible for the immediate deduction, however SBEs that have purchased vehicles after this period and have already lodged their 2013/14 tax return will need to have it amended. These claims are known as ‘loss carry-back’ rules where companies could utilise a current year tax loss against a tax liability paid in a previous year. These loss carry-back rules have been repealed. For companies with a normal accounting period, the loss carry back rules have been repealed from 1 July 2013. Simply that your current compulsory superannuation contributions for your staff should remain steady for the next 6 years. This will help with business planning, wages and salary packages. If you’re using Xero for your accounting package, these superannuation rates are changed automatically so you don’t really have to think about them from an administration point of view. It is however, important to understand how the depreciation and loss carry back rules effect you and your business. Cash flow is king in business and effective tax planning is a key. If you are concerned about any of these changes or would like to know how to manage your cash flow more effectively please contact us. Many employers and industry groups have stated that the increases in the super guarantees would in some way come out of wages offered to employees. Therefore, employees should have more money to take home making it the BEST time to get some advice on how best to plan for your retirement. This delay in the superannuation guarantee can be a good thing as you will have more cash on hand to either invest or to kick into your super yourself. Useful information. Fortunate me I discovered your site by chance, and I’m shocked why this twist of fate didn’t happened in advance!